Definitely, "Follow Me Down" by 3OH!3 feat. Neon Hitch. Its so catchy.. I love this playlist Erika! Keep up the good work! Haha, love that you included a Britney song from so long ago! And I've been listening to a lot of Hedley. I made a youtube playlist and just have it on a loop. I love Britney's cover. It's been forever since I've heard it. I'm pretty sure I need to jam to some old school Britney today! great playlist. I need to add some new tunes for the gym. Yay! I love your songs and now you have a radio? Awesome! I love it! Just about anything from Placebo these days. Love the Christina Perri "Jar of Hearts" too! The Lovin' Spoonful? Yes please. Love the playlist and pic, darling! I love the picture :) It makes me want to go to a party. Great songs! wooo hoo! such a cute idea! i want to make a playlist! I love that Mystery Jets song. The new album sounds so amazing. The new Rihanna and Eminmem song! Great list! (as usual) Happy Monday! oh gosh how I love that 'Livin' Like I Wanna' - great Monday jam. 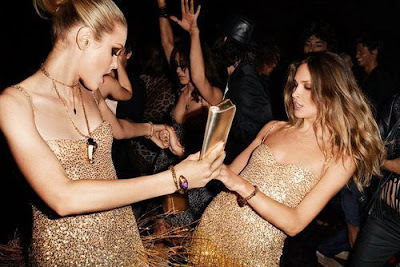 What I am loving are these 2 golden dresses!! i watched mj's this is it and am now buzzed out on his music. remember the time?? Nice songs!!!! wish I knew how to upload songs like you did. Really heating up summer with all these cool songs! Thanks so much for your feedback too. I really appreciate it. I love Britney covering that song! Great photo too. love this post, nice outfit! Oh I have a new song I think you will like! Just the way you are by Bruno Mars. You should listen to it. It is so nice! Haha I love that Satisfaction made your list. Hmm my list Lucifer by SHINee, Bad Girl, Good Girl by Miss A, and Like a G6 by Far East Movement! Ooh and Nina Bonita by Chino y Nacho! Ohhh, The New Pornographers, Air, and La Roux? This playlist is magical! I love 3Oh!3 for windows-down cruising! Oh wow..about the radio station! That is so cool! I have to say IN FOR THE KILL, no doubt!! great selection of songs BTW!!! My sound isn't on right now so I can't quite hear these... but I love seeing Britney again and I also love all the names of the bands! They sound so artful. Love the outfit the girls are wearing in the pic, also love the song Follow Me down. A radio station is so cool. I have been listening to Lady Gaga Telephone over and over again this week. I'll add Lady Gaga's "Alehandro," and Eric Clapton's (?) "Beautiful Tonight" to this mix. You have your own RADIO STATION now?!! How exciting! I'll definitely check it out!! "Miss Nothing" the new song by The Pretty Reckless! i;ve been playing again & again & again "sleeping in" by the postal service. i even posted it on my blog, hehe! im all for Air " playground love" try their song " cherry blossom girl" or " venus" im a huge fan of theirs saw their concert earlier this yr great performers lol. I also love all the other songs! great post! LOVE your playlist! I was listening this morning and had to go to work before I could comment. Great compilation! I am SOO glad you found a 'on post' player! OMG!! THIS IS LIST IS SO AMAZING!